Would you like to preserve some sweet memories of people who are best friends, lovely family members, trusted business partners or best colleagues of your team? 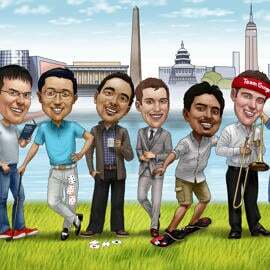 If so, we can depict them all in one funny caricature drawing, which will be executed in head and shoulders body type and colored digital style. Group caricature cannot be limited to a mere hand-drawn people, we can draw pets, vehicles and additional individual props of your choice. 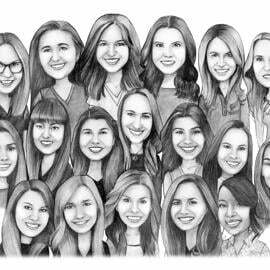 Group caricature will make an amazing and memorable gift for each person of a team. We aim to design a caricature better than you even expect it to be. 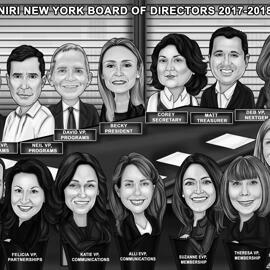 And we are welcome any of your ideas and supplied photographs, which will help us to create the most personalized group caricature for you. Digital Caricature will be delivered as printable JPG File of high quality on submitted Email. Digital Caricature is printable on any surface. We offer additional suitable delivery options at extra cost: Caricature printed on Canvas, Photo Paper or mug. Worldwide shipping is available.